Recently upgraded it to A Tune purchased from Dave @ LR. Along with 3” exhaust, Tial 38 WG with 14.7 psi spring and 3 bar BOSCH FPR. My mechanic is telling me car runs before boost worse than what it did in stock set up before upgrades. WOT in second gear at 2,000 rpm – happens nothing. Like it’s 120 HP car. Car runs very, very sluggish off boost – from take off to approximately 2,800 – 3,000 rpm. Once boost kicks in, boost is there, and holds well above what would the stock WG with CV allow. But, even at boost, top power is maybe at what be stock 951 performance and nowhere near where it should be with chip’d DME and all other upgrades. My buddy who raced 951 locally in Regional Series in GT3 class tried it also – confirmed no power at all before boost. So, I went to revert everything back to stock DME set up. Now, with board set up for A Tune, when I put the stock chip back car won’t start. 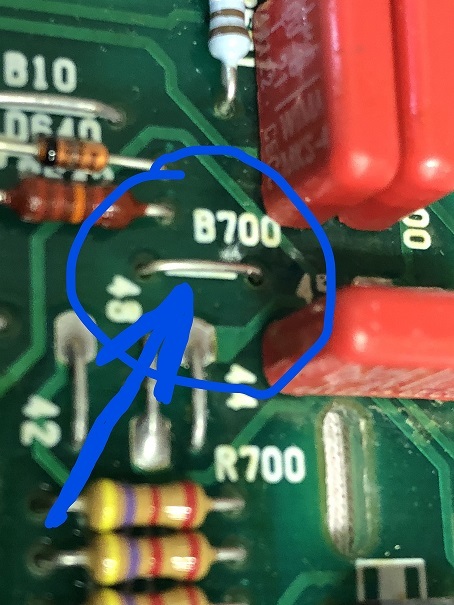 I did not tinker around the bridged board with jumper wire on B700 location. Do I need to cut that jumper? Will call Dave tomorrow but hoping someone else had to do this before. Checked lots of posts about A Tune and couldn’t find anything about reversal back to stock chip. As for the A Tune install, I see no issues. MAP wiring checks out as it should; Ground on BLACK, 1.59 V on GREEN and 5.04 V on RED when MAP connected and engine running idle. Board converted to 28 pin DME, resistor removed, jumper wire soldered on. - I have driven the car with the A Tune. Also, my mechanic did and my buddy who raced the 951 in GT3 Series / GT Challenge with CASC. - Sluggish off boost – big times. We all agree. - I wanted to put stock chip back to confirm off boost response in OE set up. - Put the OE chip back and car does not start. - Put back the A Tune chip, after trial with the OE one, and car starts no problem. Looks like you can’t go back to stock chip that easy after A Tune DME conversion??? The A-Tune, even though it's using the AFM like the stock chip does, also is set up for measuring MAP (Manifold Air Pressure). I am assuming that there were some wiring changes done to allow for this, which is likely the reason you have a no-start with the stock chip. I am pretty sure this can be reversed. The 28 pin versus the 24 pin socket can stay in there. You will have to post what exactly you did for the conversion, and we can take back a step at a time. Thanks everyone for advise. Had to remove B700 jumper - as suspected. Car is running now on stock chip. still more work to do to find out what is going on. Does it run better on the stock chip? Interesting - I wouldn’t have thought that the car would run by just changing B700. As was said before, there is 1 wire in the harness that was cut to do the installation. There is also the resistor leg that was cut. With these changes, I thought that both of those would have had to be returned to stock before the car would even start with the stock chip. If that’s the case, though, I may go back to stock to do some basic diagnostics, since I’m having some running issues. As far as your power issues go, are you sure that the FQS switch hasn’t been changed? Remember that Joshua changed all of the values for each FQS position when he programmed the A-Tune chip. So, if you were at any setting besides 0, you are now getting a much different result than you were before. Also, you can pull your spark plugs and take a look at them. They should give you some indication of whether the car is running rich or lean. And just a reminder - when going back to the stock chip, you have to go back to the stock 2.5 BAR FPR as well.